This is a set of three pages linked together. The first page is a small piece of white paper, 5 1/2" x 6 5/8". It feels like 20# bond; it has no watermark. It has some typed information at the top and a clipped newspaper article that has been glued onto it sideways. The second page is 8 1/2" x 10 7/8". It is also white, feels like 20# bond, and has no watermark. It has typwritten and handwritten material on both sides. What are labeled as "ANSWERS TO QUESTIONS" were typed, while they were numbered by hand. 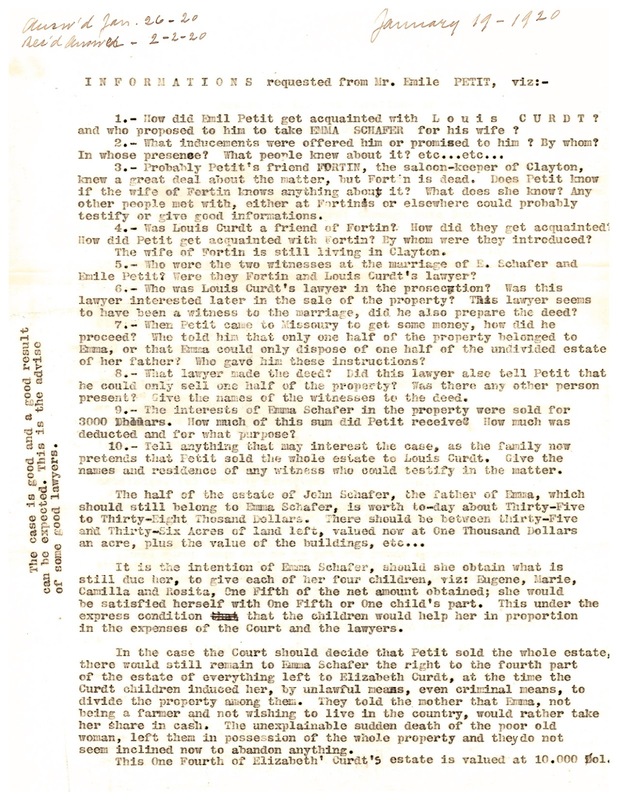 At the top of the front page in the upper left is "Rec'd 2-2-1920" in handwriting. On the reverse, in handwriting at the bottom of the page, are "I state these answers are true to the best of my knowledge" and the signed name of Emile Petit, and "Witness" with the signed name of Daniel J. Kelly. The third page is 8 1/2" x 12 3/4". This is a grayish-yellowish off-white paper. It's about 20# in weight and has no watermark. It's a lesser quality paper than the previous two. 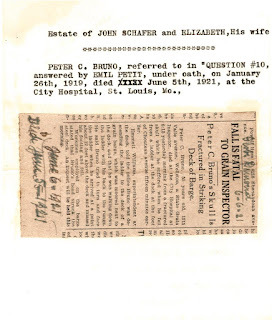 It is typed on the face with "Answ'd Jan. 26-20" in the upper left and "January 19-1920" in the upper right in handwriting. 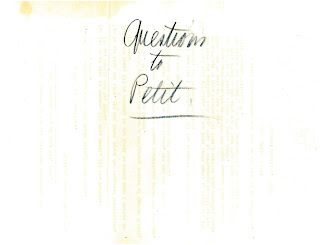 The reverse has "Questions to Petit" handwritten in blue pencil. The handwriting is similar to that in Jean La Forêt's journal. This must have been part of Jean's investigation into what happened to Emma's inheritance. 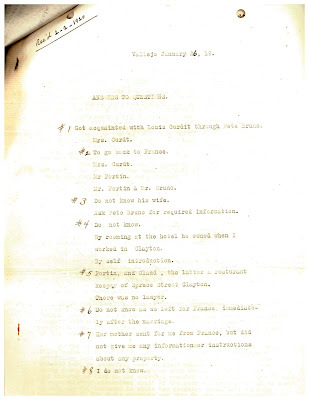 When Emma wrote, "It took my husband a good while to get all the information in the case", I was not expecting to see that he had created an actual questionnaire. He obviously approached the situation as a serious matter. It appears that Emile Petit was still living in Vallejo. At least, that's the location given on the answers page. The second and third pages are held together by a rusted straight pin in the upper left corner. The small first page has been glued onto the the second page. These scans are of two sheets of paper, one represented by the first image and one by the second and third images. The first page is 8 1/2" x 11" and is a grayish off-white. It feels about 20# in weight. There is no watermark. 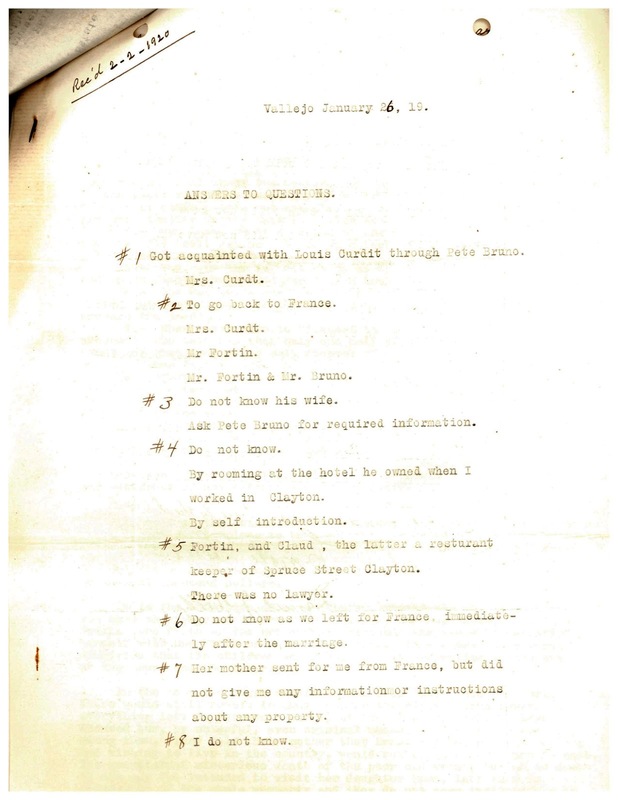 It is all typewritten except for the dates in handwriting at the top of the page: "January 19 - 1920"; "Answ'd Jan 26 - 20"; and "Rec'd Answers - 2-2-20." The writing is again similar to that of Jean La Forêt's from his journal. The second page is 8 1/2" x 11 3/8". It is whiter than the first page. It has a watermark: BERKSHIRE SOUVENIR BOND USA. 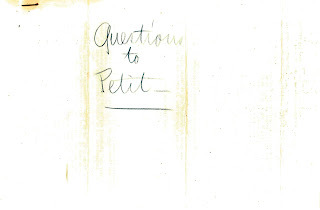 The reverse side of the page has "Questions to Petit" in what appears to be Jean's handwriting in blue pencil. These two pages are glued to each other in the upper left corner. These pages appear to be copies of the first set. The headers on the pages differ, and the second set is not a verbatim copy, but the bulk of the text is the same. On the copy of the answers, the names of the signatures are typed. This envelope is 9 1/2" x 4 1/8". It is yellowish and somewhat stained in the lower left corner. It's sturdy, apparently heavier than 20# paper. 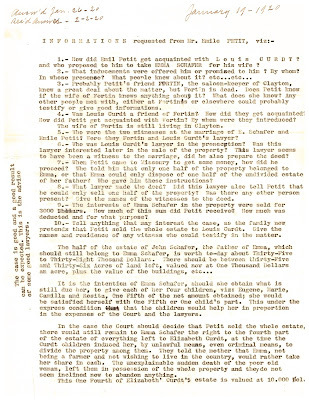 As with the envelope holding the transcription of Louis Curdt's statement, I believe the printing was by Jean La Forêt. The documents shown above were folded and in this envelope when I received everything. These two sets of documents are reminiscent of the Louis Curdt set in that Jean made an extra copy. I wonder if he was afraid that someone was going to try to take the original? Or he may have just taken this type of precaution all the time. After all, he kept all sorts of items that I've written about previously, even empty envelopes. He was very good at saving things. We've seen the response to one of the questions posed of Emile Petit previously. 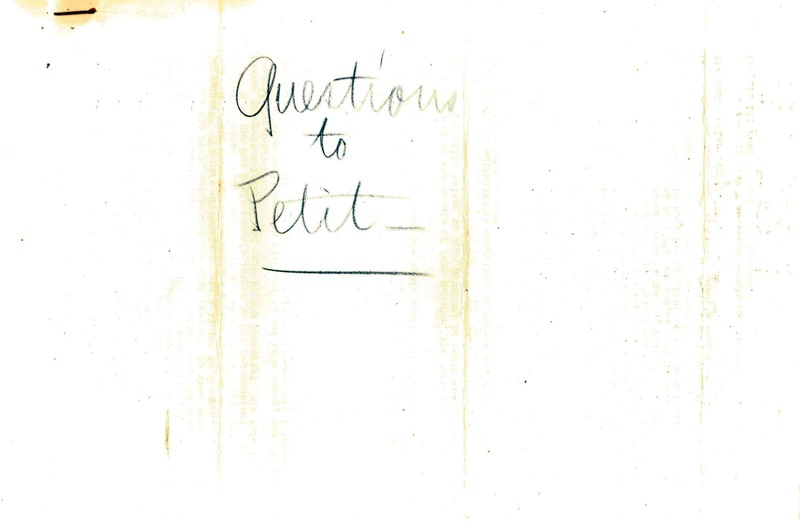 In the first part of Emma's handwritten narrative, she quoted Petit's answer to question #10 (although she had an incorrect given name for the witness). 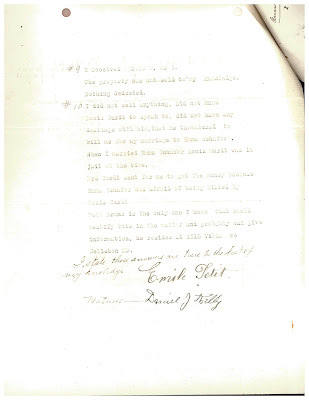 So that narrative must have been written after February 2, 1920, the date Jean wrote that he had received Petit's answers. The rest of the questions and answers don't make a totally damning case against Louis Curdt, but he doesn't come off looking very good. Neither does Emma's mother, Elizabeth. Actually, neither does Petit, who said "I don't know" a lot. On the other hand, he probably really didn't know. 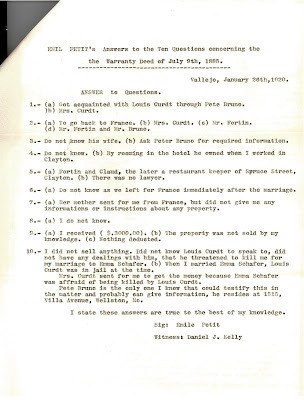 When I posted the certificate for Emile Petit and Emma Schafer's marriage, I wondered at the time who the witnesses were, and now we have the answer: Fortin, who was Petit's landlord at the hotel in which he was staying in Clayton, and Claud, a restaurant owner in Clayton. Petit doesn't really seem to have known either one, and of course he didn't know how Curdt knew them. 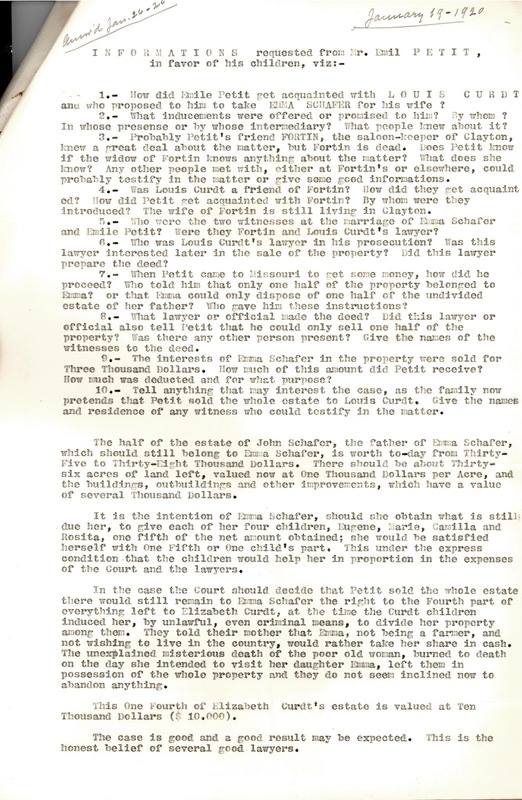 Emma wrote in the second part of her narrative that she and Jean had taken "legal advice", and that is referenced here: "The case is good and a good result can be expected. This is the honest belief of several good lawyers." Unfortunately, Jean and Emma did not have the money to press the case, and it would appear that Emma's children either could not or would not help her as was suggested: "the children would help her in proportion in the expenses of the Court and the lawyers." I'm guessing no court case was ever filed. 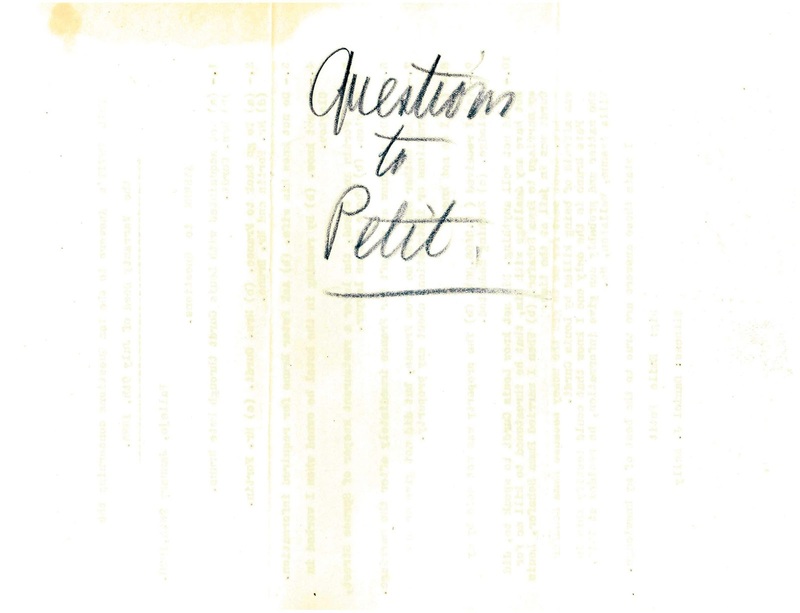 Four of Petit's responses to Jean's questions referred to Pete Bruno. Bruno was the only person Petit knew who could verify Petit's information about what really happened at the time of Emma's marriage, and who might know more about what was going on. 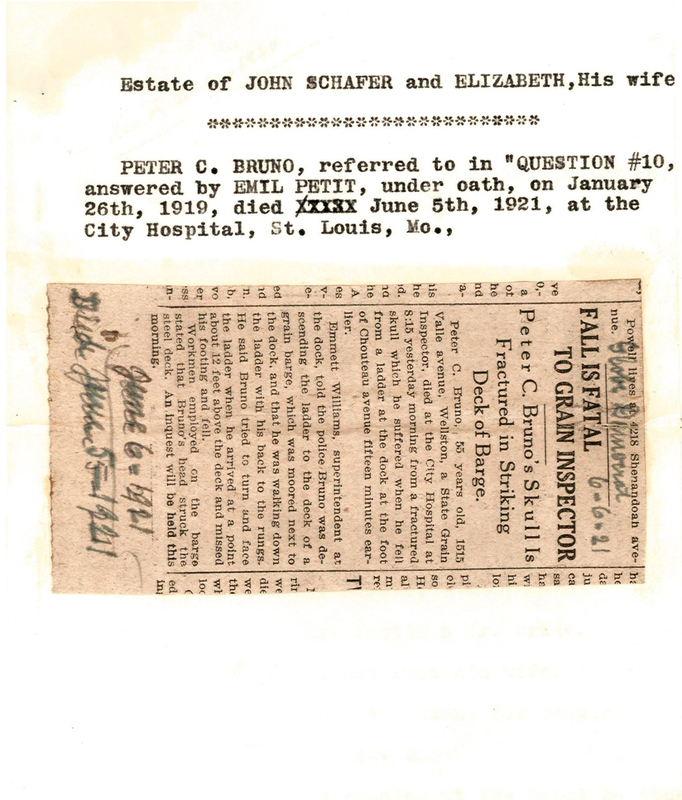 Jean included a copy of the newspaper clipping about Bruno's death in this packet. There's nothing in the description of the accident in which Bruno died to suggest that it was anything but an accident; maybe the fact that Bruno had died and was therefore unavailable to provide any additional information was the ultimate reason Jean and Emma did not pursue a court case.